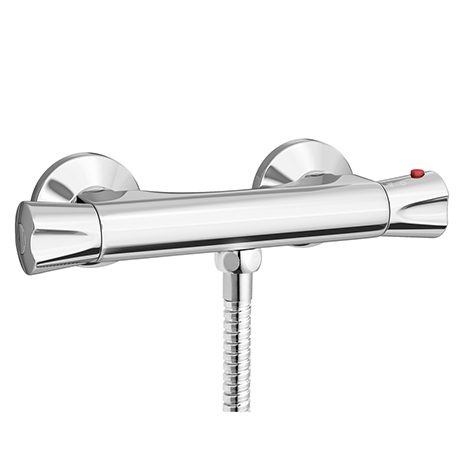 The modern Naples round thermostatic shower bar valve with bottom outlet offers thermostatic showering with two easy to operate controls, one operates flow control whilst the other allows temperature selection. Features a pre-set maximum temperature that ensures that showering is safe and convenient. Supplied with decorative shrouds/covers to protect and conceal tile/wall edge, giving the installation a neat finished appearance. Designed to be used with a slider rail kit (not included). Can't beat it for the price and looks great.